Either I’m a glutton for punishment or I’m just stubborn. I don’t want to give up on things I really like. 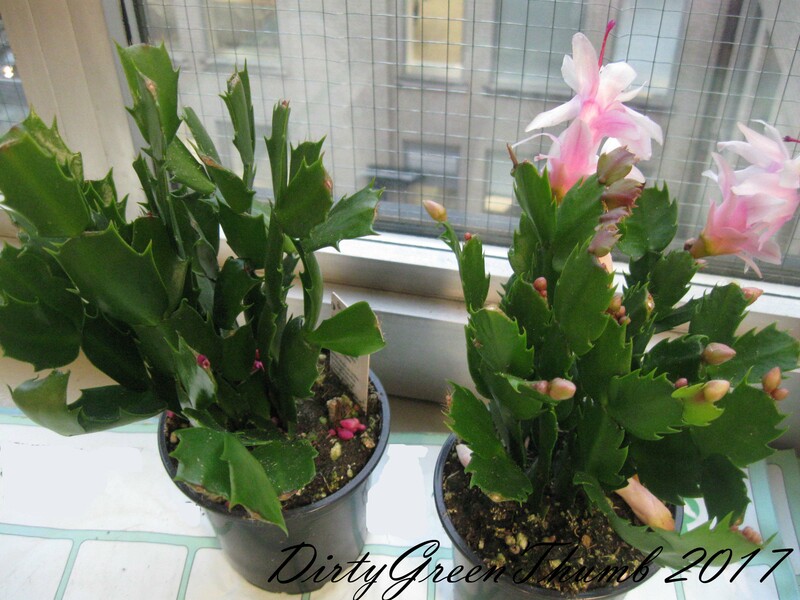 I bought myself two Thanksgiving cactus a few weeks ago at Tiny Flower, one with red blooms and one with pink. I’ve owned and killed two (or was it three?) full plants over the past two years and I haven’t been able to start new plants from leaf cuttings. When I bought these, I regaled the lady behind the counter with stories of my failure with this plant and asked for tips of how to keep it alive. She said not to water too much; that’s usually what kills them. Once every 3 weeks is good enough. So that’s the plan. Fingers crossed that these two will make it. To my horror, my prized pilea dropped all its leaves after I moved it away from the window when the temperatures started dropping. It looks done for, doesn’t it? I was upset but couldn’t bring myself to toss it, especially after building up the courage to ask for it. I convinced myself that perhaps this was normal. I noticed earlier this year that my rubber plant was dropping leaves. Eventually it stabilized after forming a trunk. I thought perhaps the pilea was doing the same thing. So I brought it to work to get more light and low and behold, new leaves are forming! I tend to get a little obsessed with things. Like when I see a plant I like, I can’t stop thinking about how I can acquire it by any means necessary. Like the giant snake plant I saw at offsite meeting several months ago. How could I sneak home a cutting without anyone noticing? I decided not to chance it; didn’t want to make a bad impression on people I’d just met. I was walking home one day in May and very near my home I spotted a recent obsession, a pilea peperomioides! This plant had been coveted by many people on several of the Facebook groups I followed so I was excited to see one right in my neighbourhood. And most importantly, it had babies!!! Babies hiding underneath the mother plant. And a leaf breaking off. Problem was it was in the window of what looked like a place of business, but there was no information about the business or opening hours. Sometime later I was taking the bus in to work than usual and I noticed someone walking around in the office. Perfect!, I thought. I would muster up the courage to ask for a baby. I’m pretty shy so this was a big step for me. And you know what? I was successful! The lady was nice enough to open the door when I knocked. I told her I’d been walking by when I saw the plant and asked if she’d be willing to part with a baby; she gave me two. I gave one to my garden friend and she was nice enough to pot it for me. I haven’t found the perfect place for it at my home yet. It didn’t seem too happy on the west-facing windowsill and it still remains a bit droopy on my plant table near the less-bright east-facing window, which has a tree in full bloom in front of it at present. I hope it will find it’s way and make some babies in the near future.